I'm fascinated by Panini packaging. Panini Black football had the cube and ridiculously large pack... and this product has the four mini apple turnover type boxes within a larger box. When all is said and done and all the cards are out of their packs, they all become just a stack of cards... but still... I think Panini puts a lot of thought into their packaging, and getting into the product is half the fun of breaking. Each part that a collector unwraps could be called a 'barrier of anticipation'. The only thing I wasn't very keen on with Absolute was the clear pack wrapping within the smaller boxes. It's just weird to have clear cellophane as a pack wrapper don't you think? I do. The Absolute base cards come on thinner foil board card stock, similar to Panini Limited. While I do like the overal design scheme of the base card, I'm not a huge fan of the type of foil Panini uses here. In light, the refracted rainbow effect only shows up in certain vertical bands across the front of the card. This effect gives the impression that the card is unbalanced. I would actually prefer the Certified foil-type here. That foil is flatter but has a more even look when light shines on it. Aside from that, everything else is cool. I particularly like the bottom of the card where all the information is. It's a solid design that is simple yet bold. The gold foil and white backing make a striking combo. Of particular note is the Absolute logo - it's very well done. The autographed cards in Absolute are of the sticker variety. Obviously, it'd be nice to have athletes sign everything on card, but we all know that makes things more difficult for the card companies. The stickers that are used in this product are 'ok' as the sticker is pretty transparent (though it's still pretty obvious it's a sticker)... but my gripe comes in that the autographed versions of the base cards just have a sticker slapped onto the face of the card. 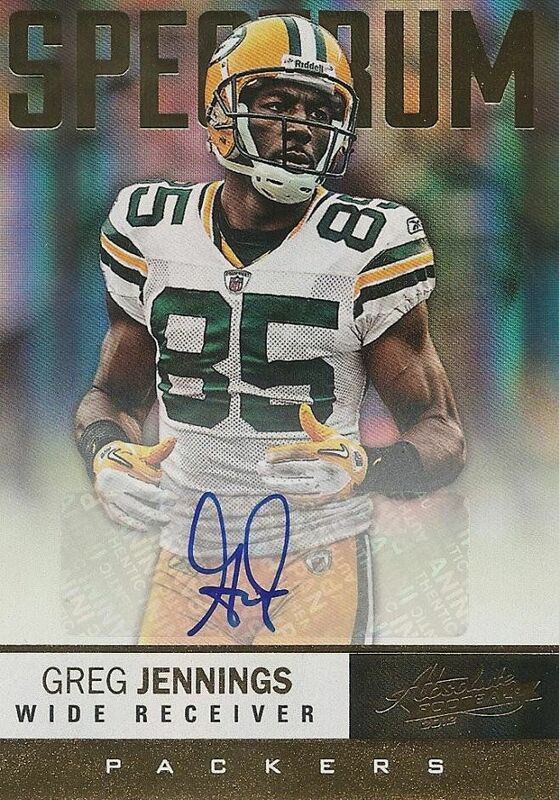 Though cards like the Greg Jennings shown above has a bit of white space for the autograph, it's still not an ideal solution in making the sticker less noticeable. By now there are many card designs that hide the fact that stickers are used. I think Absolute attempt to do the same thing. 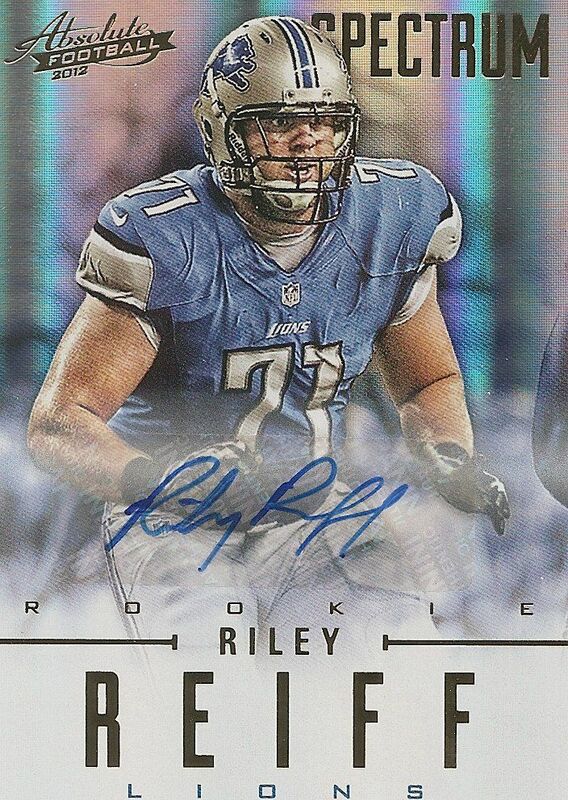 My rookie autograph was of Lion's defensive tackle Riley Reiff. Because of the position he plays, this card will probably never reach a high dollar value... but Lions fans and collectors would probably want to add this card to their collection. In football, as I've stated before, there are many, many rookie cards like this. They have to be in there, I guess, but it doesn't make for a very exciting pull. On the event-used material side of things, Absolute does a great job of giving collectors some very nice looking cards. 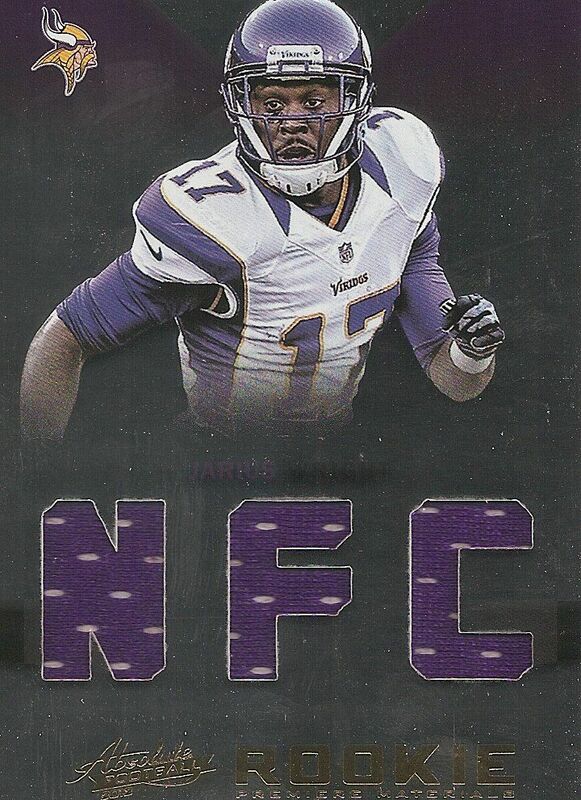 This Jarius Wright Rookie Premiere Materials card makes good use of foil and die cutting technologies. 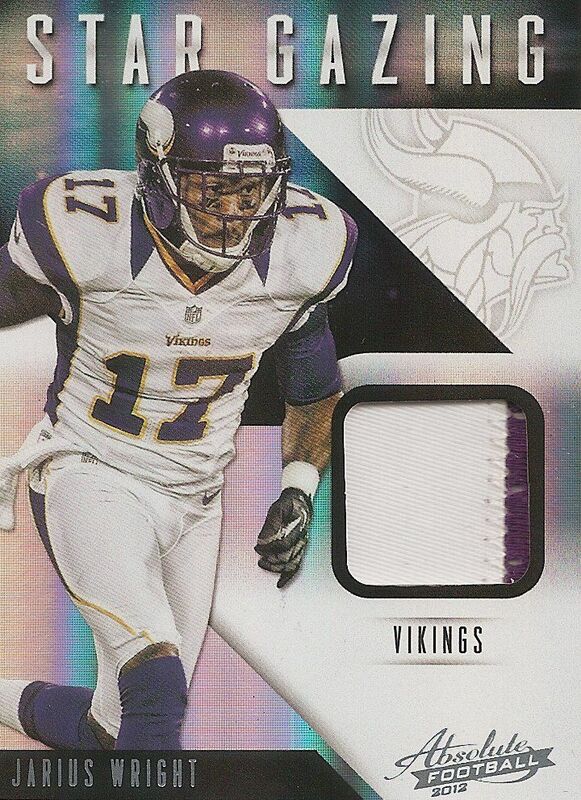 Even better than the Jarius Wright Premiere Materials is this Star Gazing patch card of... yep... Jarius Wright! I guess this was a Jarius Wright hot box. Though the design on this card is very busy, all the components work together well to leave no wasted dead space. The patch in the card is also pretty good. It's two color, but there is seam showing and you can tell it came off of a number or letter from the jersey. I don't think I got the best box of Absolute (maybe I would if I were a huge Viking or Jarius Wright fan), but I have seen some pretty awesome breaks of this product on Youtube. For about $150-$160, collectors can find four hits in four apple turnover boxes. To me, it's a bit steep, but collectors will find some pretty high quality cards inside. Absolute is a brand that has stuck around so there is already and established collector base for these cards. I would recommend purchasing Absolute - Panini has come out with some eye-catching cards in a satisfying rip. Not all boxes (like this one) will be winners... but that's a given. Panini has a good thing here with their Absolute brand. Let me know what you thought of Panini Absolute or my review of it in the comments section! love design! 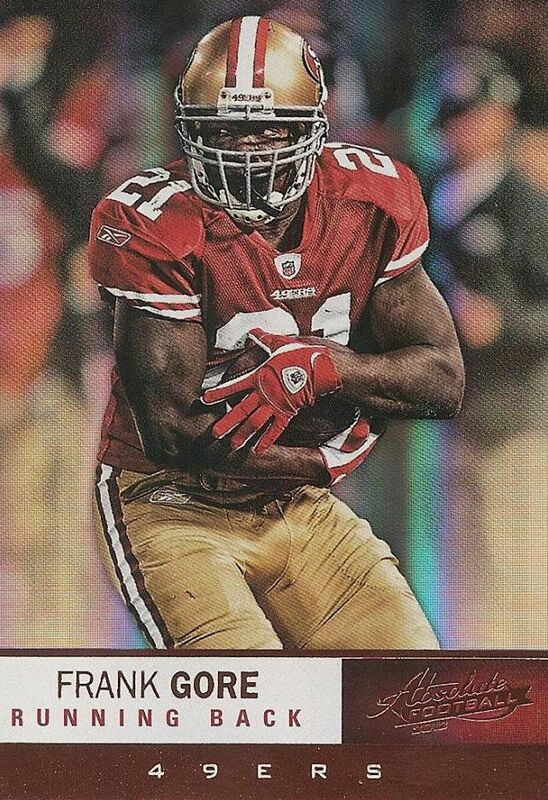 Great looking card for my favorite player Frank Gore! Very nice product!! The cards look very cool and clean. 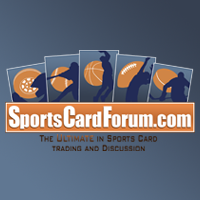 This product is much better than the basketball product and that is coming from a big basketball card collector. Love the product! Although the stickers can get annoying, the main rookies signed on card. The Jarius Wright cards are nice because of the Vikings making the playoffs. Judging by your reactions to the cards pulled you seemed unsatisfied... but still gave an 8/10? If it wasn't a free box would you still give such a high review? It deserves 7/10 or less, the price is $10 too expensive. Greedy Panini. i actually think my box was one of the worst boxes i've seen. i have watched a lot of the boxes opened and have seen some pretty sweet stuff come out. so my score comes from the overall scope of what i've seen since the product was released. I do like looking at how the NFL cards are coming out these days. Too bad hockey isn't the primary focus though! Looks really great! Wold love to get this box! And wold be great if they would do this with hockey! Great break, the cards are clean, I enjoy the shine of the cards. The are crisp, great texture. I hope the make a product for Hockey one day. sweet jennings auto! i like the base card design aswell as the design of that nfc triple jersey. I'm 50-50 on the pack within a box, within a box instead of a pack within a box.also i would like to see an absolute style hockey product. sorry about my last comment "sweet jennings auto! i like the base card aswell as that nfc triple jersey. i'm 50-50 on the pack within a box, within a box instead of pack within a box." i forgot to leave my youtube username! Great reveiw and card break. 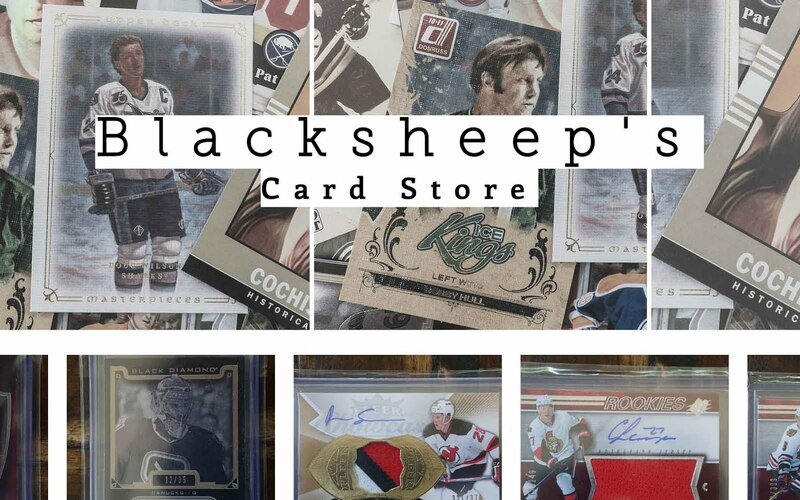 I more use to your hockey reviews and I am a huge hockey card guy. Though I do collect packers. So If you don't want that Jennings he is my favorite player. This product looks really cool, not personally a huge fan of wasting to much material to packaging, even if it give it an even more classy feeling. All the hits look pretty nice, and I love the base design! don't really like the style of using so much packaging. I think its a really big waste, but I love the design looks just like certified. 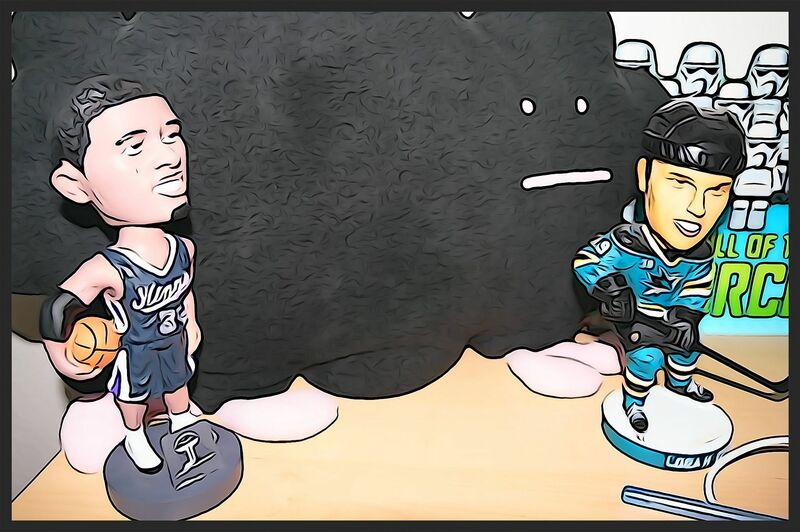 they should do a hockey product like this. Product looks okej but still Panini cant stop making these sticker autos for their product? For the price we pay the must be on card. Much value and so much more fun to have.